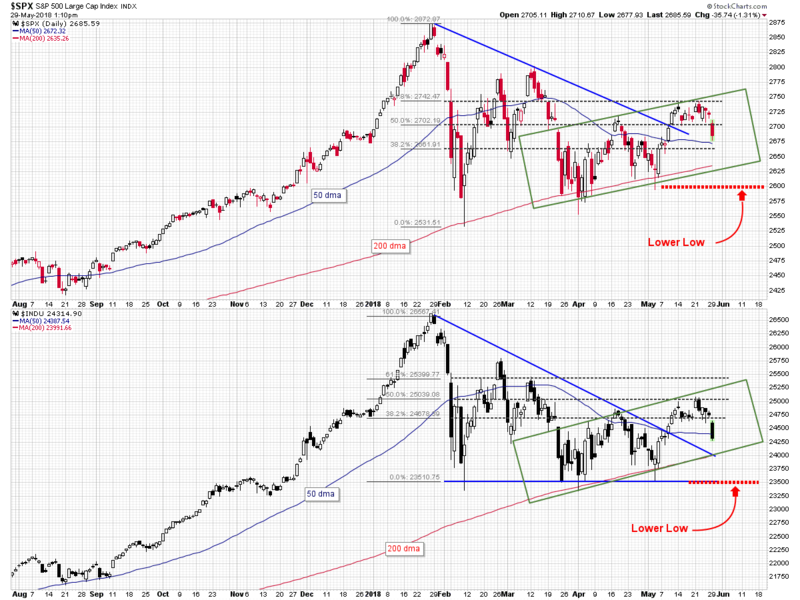 There are several ways to look at the S&P 500 Index and the Dow Industrial Average daily charts. One view is that they are rolling over after breaking out of three-month triangle patterns and then failing to maintain upside momentum; another could be that they are bouncing between levels of support and resistance supplied by their respective 50 day moving averages and Fibonacci retracement levels; and finally they could be simply moving in the normal dynamic of higher highs and higher lows within the parameters of their rising channel patterns. There is a lot going on on these charts, but the levels that should be watched most carefully are the “lower low” levels. On the DOW that level is 23,500 and on the S&P 500 index it is 2600. Failure of these levels represents confirmation of failure of support for all of the multiple technical scenarios. There are also upside levels to watch, of course, and potential bullish trading opportunities. 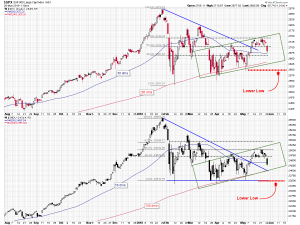 The markets could continue to “chop” along as they have for several months, moving between trend lines, Fibonacci retracements, and moving averages before tracking higher. They could also reverse hard and quickly eclipse their March highs. But profit protection is job one and the new low levels on the S&P 500 index and the DJIA should be watched carefully.